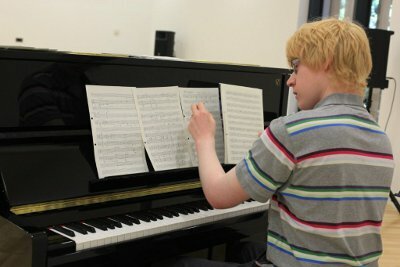 A week long series of workshops based at the Royal Welsh College of Music and Drama. Lloyd has been working very hard over the past few years on this mammoth task. Lloyd, who is currently studying at the Royal Academy of Music, has been mentored through the project by internationally acclaimed arranger Lawrence Ashmore. The project will culminate in a public performance played by The BBC National Orchestra of Wales on 3 March followed by a full recording of Breaking The Wall on 7 March 2012. This gives UCAN Productions time to create performances for the Olympic celebration. UCAN Members and Trainers including Giles Abbott, Professional Storyteller from London have been working very hard on narrative and creative movement piece to accompany Lloyd’s music.